Hailey Bieber rocks two different outfits while stepping out in the Big Apple. The 22-year-old model was spotted leaving her apartment to grab a couple of iced coffees on Friday (March 8) in New York City. For that outing, she looked sharp in an oversized red blazer, a knitted black turtleneck, loose-fitting, rolled-up black jeans with a black and silver belt, white sneakers, black sunglasses, and a red scrunchie. She later wore the same outfit but with a trendy Off-White coat. ICYMI, see how Hailey‘s husband Justin Bieber recently reacted to Shawn Mendes liking an Instagram photo of Hailey. Justin Bieber Joins Wife Hailey for Sunday at Coachella! Hailey Bieber Has Big Plans For Her Future & It Involves Using Justin's Last Name! Kendall Jenner & Hailey Bieber Keep Close at Coachella 2019! Justin Bieber Honors Wife Hailey with This Poem He Wrote! 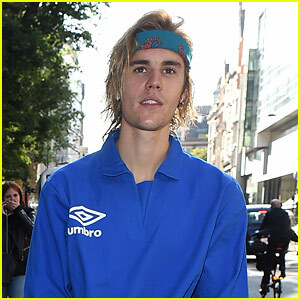 Justin Bieber Implies Wife Hailey Is Pregnant - See the Posts!